I’m struggling a bit getting ready for the new school year. So many distractions and I’m not fighting very hard to win (read: losing). I’ve said before that I love planning (I over-plan). Feel organised = Feel prepared = Feel calm; except calm isn’t a word generally associated with me. haha. I don’t feel organised. I don’t feel prepared. I don’t feel calm. I feel jet lagged (just lost your sympathy then, eh?). Actually, I feel excited BECAUSE I start a new teaching role. This time ’round, I’ll be with TAS (Technological and Applied Studies) rather than Maths. Full teaching load and no official tech integration duties. It’s at an independent girls’ school and I’ll be teaching mandatory Technology in years 7 and 8, Info and Software Tech in years 9 and 10 and Info Processes and Tech in years 11 and 12. I’ll be teaching years 7-12! Big focus on Design and projects. I was wrong to say that I’m not teaching Maths this year because there’s actually a lot of maths in the subjects I’m teaching. The big difference is that now, the maths will be in context and applied….the way I want to teach maths. The TAS curriculum has core content with several options to apply the core content via projects. What this means is that PBL becomes the natural pedagogical choice (for me, anyway) as pre-cursor to the assessed project work. And yes, I distinguish between project-based learning and project-work. PBL becomes the norm. I’ve never taught mandatory Technology before. My rotation will involve Digital Media but mostly it’s Textiles. How cool is that? I get to bring in my interest in colour theory, design principles and sewing. It’s all new really and there’s so much to learn. Now if I can just channel some of this excitement into focusing to get organised…. I spotted this sign in one of the back streets in Montmartre, Paris; in the residential side, not in the tourist hub. 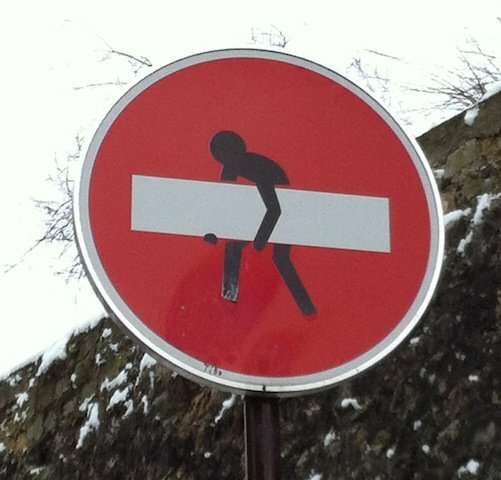 It took me a while to figure out that the sign was your usual no entry sign but had been altered in a more fun way, I think. Granted, it looked to be a completely different sign, e.g. 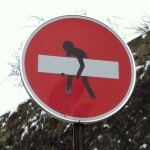 different meaning BUT I just fell in love with the artistic approach to defacing the sign (if you can call it that). 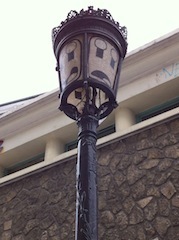 Also in Montmartre, I spotted this lamp post with emoticons on the glass panels. Can teaching be approached the same way, i.e. seek different perspectives, enjoy the unusual (every student is an individual, after all), maybe inject a bit more art and fun, maybe dare go where I’ve previously not dared? As mentioned in my last post, Walking the walk, I recently completed a 2-week casual teaching block and agonised about walking MY walk. So, here’s another story…this time with Year 8s and on the topic of Rates and Ratios. I had one lesson (yes ONE, the 3 with the year7s was a luxury in comparison) by the time I got my act together! Enter the Vitruvian Man again (yes, I’ve used him before, on Percentages and with more prep). Remixing my original idea was easier than starting from scratch! By the way, the previous time was with strugglers and this time with high achievers….note the differences in the activity, not just topic-wise but in also tasks…which also show how my teaching approach is evolving towards inquiry and reflective practice. 8mata1_vitruvian – have a squeeze (pdf) and remix if you like…the Vitruvian Man is a maths teacher’s friend! In a nutshell, the students were meant to investigate the “accuracy” of the Vitruvian Man ratios, extrapolating their own, apply some ratio skills AND reflect on their leaning. That’s not too much to ask in one lesson, was it? And by the way, they were going to use 2 technologies they’ve never used before: Wallwisher (which turned out to be blocked. gah!) and Dropittome. They had to submit TO ME and they won’t see me again. CRAZY! So, I completely forgot about this until a week later …. mostly, I didn’t think any of them would submit work to a casual teacher … I mean, really. No grades attached. Is the theory 100% accurate? Is the growth of your arms in proportion to the growth of your height? Is the length of your foot, equivalent to the length of your forearm? Do these ratios work for everyone? What is the ratio of the length of a hand to a full arm span? 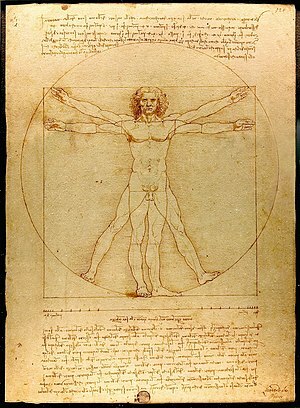 When was the Vitruvian man first drawn/created? Ratios are good because they make it possible to work things out rather than have to measure them every single time. They may not always be 100% correct, as it was proven with my measurements. Although this task was reasonably difficult in the beginning, I found that it was reasonably accurate and correct, as we further investigated Da Vinci’s theory. My results displayed similar findings to the theory; I further developed my rates and ratio skills. Prior to this maths topic, I didn’t completely understand it, however now I find that I can use ratios in many other places to simplify, numerals I am given or to find and approve theory’s such as the Vitruvian theory. I really enjoyed this lesson. I liked how we got a chance to put our maths into practice. That kid saying ‘reasonably difficult’ was being truthful! I nearly abandoned the activity! I’m glad I didn’t. Unlike my strugglers before who were keen to get straight into measuring, this high-achiever class had to be prodded away from their calculations and musings. I’m sure there’s something there but I’m not going into it for this blogpost. Can programming help students appreciate Maths more? I love it when things start to converge in my mind. This post will attempt to encapsulate this convergence; attempt being the operative word. As Jack Dorsey said, simplifying the complex is not easy. Try I must to help me document my thinking. I blogged about Maths not = calculating in reference to Wolfram’s computerbasedmath.org initiative and mentioned it in comments on relevant posts of other bloggers and to anyone who cared to listen. I recently attended webinar with @ColinTGraham on Teaching Maths Effectively which led me to Project Euler. I signed up to this project and had a go using Microsoft SmallBasic, a free and easy to learn/teach programming language. I read @garystager’s post on Charlie Rose‘s interview with Jack Dorsey, Chairman and one of the three co-founders of Twitter; I watched the interview as well. I think perhaps that only developers can really appreciate Stager’s (and Dorsey’s) view on elegant code (I happen to as I was in Software Development for years before going into teaching). One of the challenges of maths teachers is making maths relevant. Also, Wolfram mentioned that students often do not see, much less appreciate, the beauty of maths – especially when drowned in the number-crunching (read calculation) jungle. Anyway, I’m coming to a conclusion that there is definitely room and reason for integrating programming in school and not necessarily as a separate subject/course. In my previous high school, I did suggest this as an extension activity for a very smart girl and in fact, introduced her to SmallBasic. My suggestion to use some Maths lesson time was rejected for various reasons including there’s no one really able to support this idea and struggled to justify the suggestion. Fast forward to now and the previous paragraph is justification enough. I’ve only done a couple of problems on Project Euler. It offers much opportunity as an assessment tool – you need to decode the problem in order to code. The process can run the full gamut of the digital Bloom’s taxonomy – from remember through to create. For example, what does multiple mean? I used to say it’s the times table of a number. But, how do you code that? Well, a number is a multiple of a given number if the remainder is zero when you divide – there are programming functions for this (language-dependent). Now, there’s a definition not often mentioned. And “below 1000” provides an opportunity to apply inequalities. Project Euler definitely provides an avenue for computational thinking that Stager and Dorsey espouse and openly enjoy. Upon solving problems, you get access to the solution and the forum so you can compare your own code. The pursuit of elegant code is very obvious in the forum. What this means, too, is that participants are naturally differentiating the task – motivated by finding the most efficient solution – often due to deep knowledge of maths (including finding patterns) and not so much programming ability. How awesome is that??? Actually, reading some of the comments help one appreciate the depth and beauty of maths that Wolfram – and passionate maths teachers – allude to. Programming is problem-solving. It promotes analytical and logical thinking but not at the expense of creativity as both Stager and Dorsey argue. In fact, I daresay a good programmer has to have a healthy dose of creativity. Programming provides instant feedback (read: gratification or frustration). Though much can be learned from programming, it really is not for everyoneI…not because it’s hard necessarily but because it doesn’t appeal to all such as carpentry does not appeal to me, for example; I’m sure carpentry provides fantastic opportunities to apply mathematical concepts and more besides. I understand apprehension to even try to include it as a teaching strategy, but there is help out there. Just as there is a community of developers out there, so there is too of teachers. As an IT integrator, I plan to approach the Maths and the Technology Departments (the elective programming course was dropped due to dwindling numbers). I’ll walk them through my rationale mentioned above. Then, who knows? Do you know any other initiatives similar to or linked to the ones above? I came across computerbasedmath.org (maths ≠ calculating) via @JeffUtecht’s post My 25%PD. Both these links are worth visiting but let me focus on the first. computerbasedmath.org founded by Conrad Wolfram – yup, the Wolfram behind the site anyone who’s ever googled a maths problem/question would have visited at some stage. Conrad Wolfram’s TED talk \”Stop teaching calculating – start teaching math\” is an engaging insight into how maths education can be…and it’s a big challenge in many ways, e.g. Shift the focus on calculations/computations to real application of maths by using computers/technology to do the calculations. Change current scope-and-sequence driven by the difficulty in calculations rather than concepts. For instance, with interactive visuals even primary/elementary students can access concepts such as calculus. The best way to teach procedural aspects of maths is to involve programming (I agree as the process of defining an algorithm deepens understanding). This is what I have been trying to do – in a rather crude form – in the past few years. And #5 is a real dilemma. Also, any change must be systemic because I find that students, whether they like it or not, come to expect a “format” for maths lessons. While I enjoy veering away from the standard format, I know that the expectation is there to “teach calculation”. I’ve signed up to support computerbasedmath.org to be in the loop and help spread the word. I wonder if I’ll see any changes along these lines in my lifetime. I think the Australian national curriculum changes for maths embeds calculation more than ever. Btw, I should add that the website links to plenty of interactive resources allowing teachers to follow these principles. It also seems that programming contributions are also welcome. These people are serious. Do check them out. Today was the first day of the AIS IT Integrator Conference 2010 and there’s heaps to blog about, for sure, but one that really touched so close to home was the session entitled “Thinking Hyperbolically!” I feel inept in my attempt to capture the enthusiasm of the teachers who presented or the magic of their creation. Bear with me. takes an exciting and creative approach to curriculum and draws on a range of ICTs to enhance the learning of students in both Design and Mathematics. Using the expertise of both teachers, students explore areas as diverse as codes and ciphers, visual representation of data, topology and nomography. Each mathematical construct is explored as a concept or theory and then synthesized into a design expression, giving additional insights in new and exciting ways. ICT is utilised in the creation of form, the expression of information and the beauty of mathematics. Emerging areas of information analysis, such as data representation, give depth and beauty to mathematical knowledge, allowing for both a clarity of understanding and an appreciation of the beauty of maths. I absolutely LOVEd this. ICT was so integrated – it’s really another tool for teaching and learning. Exploring various ways of expressing self, mathematical concepts and even colours must be quite fascinating. the possibility of allowing those who would typically be maths-averse to see the beauty of maths, e.g. as an art form. Actually, it’s not just “see”, as these teachers are exploring other senses. I’m not sure which I’d prefer to be: teacher or student of this course. Can teaching maths be more like this or is the focus on rigour holding us back? I am hoping that these ladies will share their work more widely than this conference. Blogging about it here is a step but surely much more can be done. Any ideas welcome! My blog posts are my thoughts and perceptions. Please build on. It'd be great extend the conversation so please comment or pingback if my post inspires you enough to write your own.